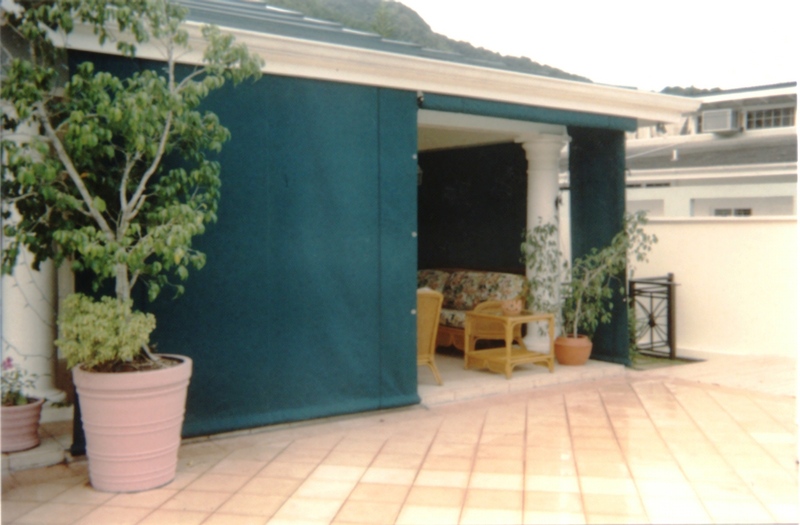 Available Styles: Roll-up blind (manually operated), Mastershade/Maxi Drop Curtain (manually or electrically operated). 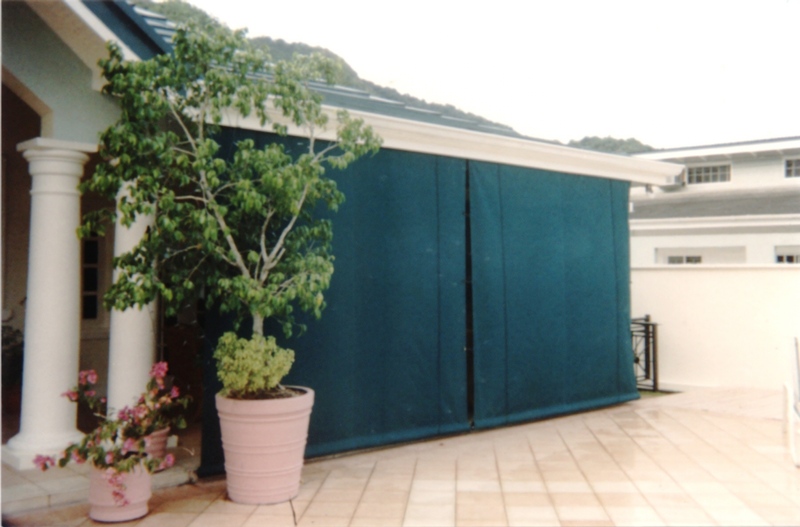 Applications: Protection for patios or windows from sun and rain, privacy. Manually operated via a pulley system is fastened to wall surface using stainless steel screws through a 1″ aluminium flat, which is inserted into a pocket at the top of each blind. the blinds are weighted at the bottom and secured whilst down using stainless steel fasteners. They are held in place whilst retracted by wrapping the olyester cord around a heavy-duty polyethelyne cleat. Fabric: Sunbrella acrylic canvas, Soltis 86 or Soltis 92 PVC-coated Polyester Mesh, Crystal Clear 30 Guage Vinyl. » Available in 64 solid styles and over 100 striped styles. Sizes: Roll-up Blinds and Mastershades are available in 3′ to 14′ widths, and 3′ to 12′ lengths. Maxi drop curtains are available up to 20′ in width and up to 14′ in length. Both systems are operated either with a standard pull tape, or optional hand crank or motor. Automatic and remote control features can be added for extra ease of operation. The fabric in the Mastershade runs inside a vertiacl track, and the Maxi Drop Curtain runs along cable guides by means of graviy. When the shade is retracted, the fabric is stored in the built-in protective Box. A specially designed horizontal weighted front bar keeps the fabric taut.